This year's peony season opened on Memorial Day (May 29) with M. Jules Elie (Crousse 1888). The Monsieur always looks fabulous in the first few days of opening, but this year the first set of blooms flounced off the stage after a flamboyantly short appearance (much like the artist formerly known as The Artist Formerly Known as Prince). But plenty of second-round side buds, so enough with the complaints. The garden's been bathed all spring with sweet, steady rains, and I have never seen peonies this tall before. 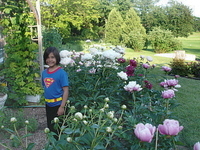 Supergirl/peonygirl Veronica is standing next to James Pillow (Pillow 1936), who opens pink, mutes to cream, is full and fragrant, stands tall, blooms long. He reminds me every year that he's just about my favorite peony of all time. I'm jealous. I recommend Jane Kenyon's peony chapter in One Hundred White Daffodils. The garden's been bathed all spring with sweet, steady rains, and I have never seen peonies this tall before.